Arilbreds are classified according to the quantity of aril ancestry they have, and whether that aril ancestry is oncocyclus, regelia, or both. Arilbreds with only oncocyclus and bearded ancestry are called oncobreds; those with only regelia and bearded ancestry are called regeliabreds. Nearly all commonly grown arilbreds, however, are of mixed ancestry: oncocyclus, regelia, and bearded. These are called oncogeliabreds. The Aril Society uses a special notation to indicate the amount and type of aril ancestry that an arilbred iris has. The abbreviations OB, RB, and OGB are used to indicate oncobred, regeliabred, and oncogeliabred, respectively. Then a "+" or "-" is added to show that the iris is more than half aril or less than half aril. No added symbol means it is half aril. For example, OGB+ signifies an oncogeliabred that is more than half aril. 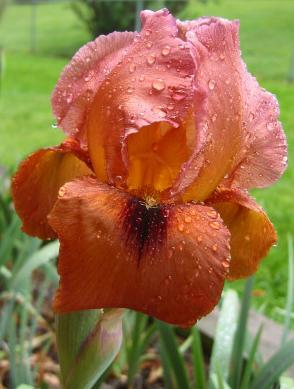 The OGB irises comprise the largest group of arilbreds and have the best balance of aril characteristics with ease of culture. Small arilbreds with dwarf or median ancestry are sometimes referred to as "arilbred medians." This is not an official designation, but it can be useful in selecting plants for the garden. Most arilbred medians fall in the OGB- class. Beginners new to arilbreds can use the following as a guide, although it is only a rudimentary explanation to the classification system. 3/4, 1/2, and 1/4 breds refer to tetraploids. 1/2 breds may also refer to diploids. 2/3 and 1/3 breds refer to triploids. Pentaploids, hexaploids, octoploids, and others exist, but are rarely encountered. A more thorough explanation of arilbred classification is included in the ASI Checklist. 'Vera Marina' (top left) photo by Cindy Rivera. 'Babylonian Fires' (lower right) photo by Betsy Higgins.